Now that tax season is upon us, it’s even more important to be vigilant about the latest tax scams and fraudulent activities that could lead to identity theft. The Internal Revenue Service has announced its annual ‘Dirty Dozen’ scams for the 2014 tax season and encourages taxpayers to pay more attention to their finances and tax-related activities during peak filing season. The IRS has discovered a significant increase in local phone scams where callers claim to be IRS representatives and attempt to steal money or personal information from their victims. 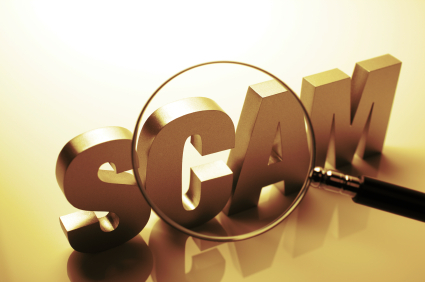 Signs of a scam include: using fake names or an IRS badge number; being able to recite the last four digits of your Social Security Number; imitating a toll-free IRS number; sending bogus IRS email; mimicking a call site with fake background noise. More sophisticated phone scammers target recent immigrants and inform the victim that they owe the IRS money. Anyone claiming that you are eligible for a very large federal tax refund may be a scam artist. Scammers create false hope for their victims and may even charge money for their ‘advice’. In the worst cases, the victim ends up filing a false return or loses their federal benefits. Be careful about who you choose to prepare your tax return. The IRS warns that intentional mistakes can cause a $5,000 penalty. The IRS reports that approximately 60 percent of taxpayers turn to tax professionals to prepare their tax return. Unfortunately, scam artists prey on these people and are not qualified to prepare a return on your behalf. Keep in mind that you are legally responsible for what appears on your tax return, even if you paid someone to prepare the return on your behalf. Visit www.irs.gov/chooseataxpro for more information about choosing a tax preparer. Some people attempt to evade U.S. taxes by hiding money in offshore banks, in brokerage accounts, or other entities and then using debit cards, credit cards, and wire transfers to get the money when they need it. Other illegal activities might involve employee-leasing schemes, using foreign trusts, and setting up private annuities or insurance plans specifically to avoid paying taxes. Some scam artists attempt to impersonate charitable organizations by setting up fake websites and trying to solicit funds from victims. This happens more frequently after a major disaster because scam artists know that many victims are emotionally involved with the incident and may be in a vulnerable state. The IRS warns that it is important to be wary about donating cash and sharing personal information such as your credit card or Social Security number. If you are a disaster victim and have questions about tax relief, call the IRS toll-free disaster assistance telephone number at 866-562-5227. Inflating your income or including income on a tax return that was never actually earned can increase your refundable credits but this type of activity is also illegal. Taxpayers that end up filing excessive claims or intentionally misrepresenting their income are subject to a penalty of $5,000. Anyone that encourages a taxpayer to make frivolous arguments or outlandish claims about their income or tax liabilities in order to avoid paying taxes can be prosecuted for a criminal felony. If you find yourself making these claims yourself, you may be responsible for an accuracy-related, civil fraud, erroneous refund claims, or failure to file penalties. Filing a false tax return in order to reduce your tax liability can result in penalties and criminal persecution. Scammers that encourage falsifying Form 1099 refund claims and submitting a fake return, or using your information to file false returns, are committing a crime. The IRS Criminal Investigation (CI) has developed a program to combat abusive tax schemes by identifying and investigating tax scheme promoters. They also seek out investors and parties that knowingly participate in abusive tax schemes. These schemes are defined as any violations of Internal Revenue Code (IRC) and where the taxpayer is making attempts to evade taxes. Trusts can be set up specifically to avoid taxes and anyone involved in this type of activity is guilty of fraud. Promoters of this practice encourage taxpayers to transfer assets into a trust, but in the eyes of the IRS, these types of transactions are questionable. If you are considering setting up a trust fund, make sure you are working with a trusted and reputable professional so that you don’t end up being part of a scam.